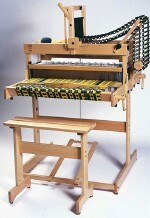 The Magic Dobby Loom is a 24-harness loom available in 16" (M40) or 28" (M70) width. It has 24 shafts for complex weaving, but the construction and operation of the dobby system are both easy to understand and simple to work with. Compact and easily folded to take along with you; electronic interface allows weaver to use patterns designed on a PC or Mac computer; full control over shaft selection managed through software. Includes raddle, 600/800 Texsolv heddles, 30 program bars (lags) with sufficient pegs, swivel (pivot) beater system, stainless steel 10 dpi reed, lease and tie-up sticks, 16 warp sticks, floor stand with treadle. Use as table loom or with floor stand.